Wine of France. This elegant white wine comes from the pretty village of Beblenheim, where the well-established cooperative has supplied the local people and those overseas with wines of exceptional value and typicity for generations. The winemaking team draw upon a wide diversity of grapes to blend the right style for their customer. As a variety, Pinot Gris produces exceptionally fine results in the dry, sunny, Alsatian climate. Here, vines situated on the marl, clay and limestone escarpments of the Vosges mountains reach an effortless maturity. Pale golden in colour, with a delicate musky aroma that gives way to an intriguingly honeyed palate, yet this wine is dry with a charming balance. The finish is full-flavoured, soft and round, making it the perfect choice to partner all manner of food accompaniments. 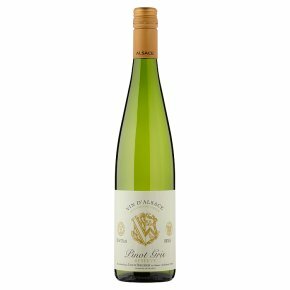 Beblenheim's Pinot Gris d'Alsace can be enjoyed on its own, but it does go particularly well with mildly spiced sausages, savoury dishes or oriental cuisine.